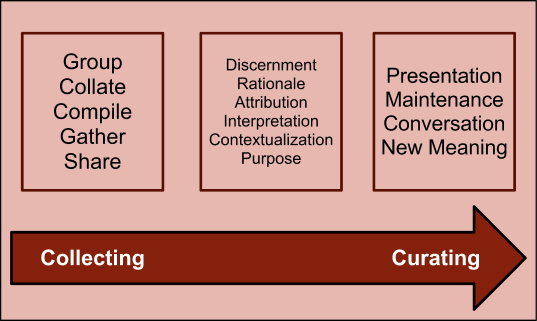 Curation - is it the new search tool (Valenza 2011), the new search (Good 2012), the future of Web 2.0 (Boyd 2010), or the new black (O&apos;Connell 2012)? What is curation anyway, and how can it be used as a tool for student and teacher learning? This essay will investigate what curation is and the different contexts it is used in. Why is it important; who are the curators, what motivates them and what makes a great curator? 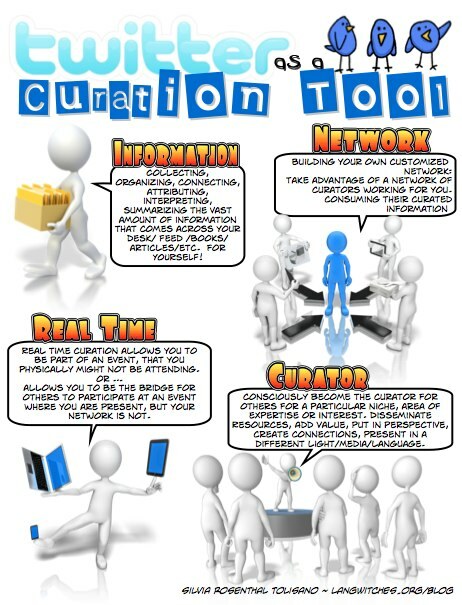 What processes and tools are used for curation and what digital literacies are required for successful curation? It will conclude with an investigation into ways teachers can use curation both with and for their students and as a tool for their own professional learning and a brief look at some curation tools. “A curator is an expert learner. Instead of dispensing knowledge, he creates spaces in which knowledge can be created, explored, and connected.” (Siemens, 2007). According to Boyd (2010) curators help people to focus their attention on the most relevant and important information streams. Valenza (2011) tells us to take advantage of the work of others passionate about a topic and use their curated work as a search tool. Fiorelli (2011) describes content curators as “critical knowledge brokers”. Librarians, journalists, and teachers have always curated: they evaluate, select, collect, present, and promote material for their users, readers and students; but these days curation is becoming an important activity for a broad range of people and for a variety of reasons and purposes. So what is curation? Put simply, curation is locating, evaluating and selecting (usually) online content on a topic, adding value by contextualising and possibly through tagging or commenting or both; and using digital tools to provide access to the curated material. A curator might be an individual or an organisation. Curators use their skills to create new meaning by combining content and context and their work is valued by those who they assist in making sense of information. (Cobb, 2010; Minocha and Petre, 2012). Pope (2011) describes how curating tweets is now an essential part of journalism. Connelly (2011) interviews a journalist who explains that journalism has always been “about being in the middle, between the story and the public”. Curating using digital tools enhances and extends this traditional role by capturing the essential elements of a story and using professional input and the tool to add context. Petrie (2011) notes that new digital curation tools force journalists to be more ethical by linking back to the original source. This facility should be equally welcomed in education settings to promote proper acknowledgement of sources and overcome plagiarism. Boyd (2010) discusses the shift from broadcast to networked information and considers the role of the curator in this shift. She states “the power is no longer in the hands of those who control the channels of distribution; the power is now in the hands of those who control the limited resource of attention” and notes that curators use their skills to attract attention while consumers go to curators to help them focus their attention at the right moment. She has concerns about the shift to networked information including the potentially misplaced assumption that it is more democratic, and the dangers of homophily. This is echoed by Cobb (2010) who urges individuals to fight homophily by mixing up the curators they follow, not just choosing those with same world-view. © 2010 danah boyd. The text of this article is licensed under the Creative Commons Attribution-NonCommercial-ShareAlike 3.0 License ( http://creativecommons.org/licenses/by-nc-sa/3.0/). EDUCAUSE Review, vol. 45, no. 5 (September/October 2010): 26-36 danah boyd ( dmb@microsoft.com) is Social Scientist at Microsoft Research and a Research Associate at Harvard's Berkman Center for Internet and Society Comments on this article can be posted to the web via the link at the bottom of this page. Curation fits well as part of "participatory culture" as described by Jenkins, Purushotma, Weigel, Clinton, and Robinson (2009), as technology-enabled individuals can "archive, annotate, appropriate, and recirculate media content in powerful new ways." Being able to critically evaluate content and share information in participatory environments is a key aspect of metaliteracy (Mackey and Jacobson 2011). Witek and Gretano, researching metaliteracy through a project where students utilise Facebook newsfeeds for study, found their students shifted from recalling and making sense of information based on what the information says, to doing the same through the lens of who shared it. This highlights the importance of knowing and understanding who a curator is and what they represent in judging the credibility of information received. Sense - the human component - make sense of and add value to the information by placing it in the appropriate context; justify the inclusion of the information. Share - use social media and/or a curation platform to deliver the messages to others. Similar to Siemens (2007) Connectivist approach, Kanter writes from a networked learning perspective. Her exposition of the mantra owes much to Jarche’s definition of networked learning “an individual, disciplined process by which we make sense of information, observations and ideas.” Jarche (2010). 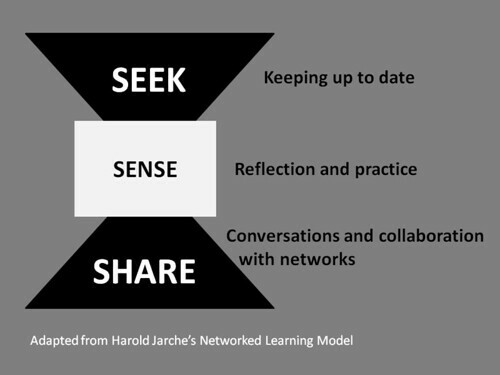 Jarche also talks about the growing importance of informal learning in the connected workplace as well as the importance of sense-making skills, both individually and in networks, as new digital literacy skills. 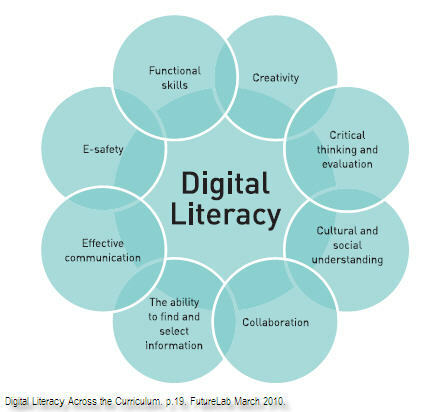 Skilled content curation employs most of the digital literacy skills, attributes and behaviours Hague and Peyton (2010) have illustrated, demonstrating the value of curation for informal and formal learning (p. 19. Whether in formal or informal circumstances, curation fits with Connected Learning Principles (n.d.) being interest-powered, peer-supported, openly networked and socially connected. Cobb (2010) sees in curation two opportunities for individual lifelong learning - find great curators to follow and become a great curator. He says finding curators with similar interests (but not necessarily opinion) and established credibility allows an individual to attend to the most relevant information pre-filtered and contextualised. Becoming a curator allows development of expertise in a field and potentially open up channels of engagement with other experts. To not be a lifelong learner is no longer an option in today’s information society with its instant, free flowing and infinite information (Wesch, 2009). Teachers owe it to themselves and their students to explore the opportunities curation creates. Swanson (2013) encourages all teachers to curate their resources, using meaningful tags, as a means of taking control of information overload. Flintoff, Mellow and Clark (2014) describe how Scoop.it’s functionality, allowing visitor comments and ‘re-scoops’, leads to participatory and collaborative learning where the construction of knowledge leverages input from within and beyond a cohort. They detail the use of Scoop.it for professional development by university staff who have collaborated in the collection of professional reading material. This has become a productive team activity reducing the amount of reading required by individuals. Flintoff, Mellow and Clark also give examples of Scoop.it being used as an activity for tertiary level students where their teachers have favourably noted the critical thinking and analysis skills demonstrated. Hamilton (2012) has had similar positive experience using Scoop.it with secondary students where, by following each individual’s Scoop.it topic she was able to provide timely feedback and suggest further content as they researched a topic.(p. 25) She explores the model of "embedded librarian" and shows how free and low-cost technologies can be used to support and enhance participatory learning experiences and foster students&apos; information literacy skills. JIME: Exploring Curation as a Core Competency in Digital and Media Literacy Education Keywords: Media Literacy, Curation, Civic Engagement, Digital Learning In today's hypermedia landscape, youth and young adults are increasingly using social media platforms, online aggregators and mobile applications for daily information use. The place of Web 2.0 tools in literacy education is discussed by Pilgrim and Bledsoe (2013), exploring what it means to be literate in the online environment. Web 2.0 tools such as curation platforms allow a student-centred approach where children can collaborate to construct meaning. White (2014) describes a school project where student curated research items for a specific topic onto a blog. Through the project she discovered that students were highly motivated by curating and found it enabled personalised learning. Mills’ (2013) study in progress is examining the role of curation habits in flipped professional development for teachers. In this approach teachers identify, contextualise and share resources prior to workshops or meetings freeing up face-to-face time for discussion and development of action plans. The study references Sfard’s (1998) participation metaphor placing responsibility for learning in the hands of the individual and embedding it in daily practice. Another way curation is being explored in education is through the creation of online curated interactive textbooks which allow teachers to bypass expensive digital textbooks which too often are merely digitised forms of the print version without interactive elements. The increasing accessibility of Open Educational Resources, the functionality of curation tools, and the push for personalised learning make this option increasingly viable and valuable for teachers and students. Find out about open educational resources(OER)and the benefits that creating, sharing and using OER can provide. Improve the way that you create, share and use OER by using our guide. Gende (2012) details the steps to creating a curated textbook. She includes guiding questions to focus attention on how the material will be used and gives a table of roles for both teacher and student participation in the curation process, depending on the learning model. Examples of both teacher and student curated texts are provided. OK...so let me clarify that title. I honestly think textbooks are on their way out...or at least I hope they are. Really it should read " Flipboard as core curation artifact for classrooms" but that wouldn't have you here reading now would it. I'm in love with Flipboard. Due to word limit restrictions this section has had to be curtailed. Here are just a few resources to use as a starting point. This List.ly includes over 80 different digital tools for content curation, which can be viewed alphabetically or as ranked as voted by List.ly members (Williams, n.d.). Fisher and Tolisano (n.d.) have categorised various tools into a digital curation toolbox. Finding educational content in the web is no big deal- but managing it, is. Educational content curation is the art - rather than the act - of sorting out the vast amounts of educational content on the web and organizing them around a specific educational topic in a coherent way. It is clear that curation offers many opportunities for teachers and students. Whether in flipped learning, developing digital literacy skills, creating custom textbooks or taming information overload the potential seems limited only by the amount of information available. Astute twenty-first century teachers will take Cobb&apos;s (2010) advice: find great curator&apos;s to follow, and become a great curator; and instill in their students the capacity to do the same so that they too are empowered as lifelong learners. Boyd, D. (2010). Streams of content, limited attention: The flow of information through social media. EDUCAUSE Review, 45(5), 26. Hamilton, B. J. (2012). Embedded librarianship : tools and practices. Chicago, IL. : ALA TechSource. Hottenstein, A. (2012). Empowering Instructors to Become Effective Content Curators Using the Building Blocks of Today to Manage Dynamic Curriculums for the Education Space. Journal of Systemics, Cybernetics and Informatics, 10(4), 94–99. Kelly, D. (2013, February). Curating to enhance organizational learning. T+D, 67(2), 76+. Mackey, T. P., & Jacobson, T. E. (2011). Reframing Information Literacy as a Metaliteracy. College & Research Libraries, 72(1), 62–78. Mihailidis, P., & Cohen, J. N. (2013). Exploring Curation as a Core Competency in Digital and Media Literacy Education. Journal Of Interactive Media In Education, 1-19. O’Connell, J. (2012). Content curation in libraries: is it the new black? SLANZA Collected (Online), (Term 2), 4–5. Pilgrim, J., & Bledsoe, C. (2013). The application of web 2.0 tools for literacy education. In Technological tools for the literacy classroom (27–45). Hershey, PA: IGI Global. Sfard, A. (1998). On Two Metaphors for Learning and the Dangers of Choosing Just One. Educational Researcher, 27(2), 4–13. Swanson, K. (2013). Professional learning in the digital age: the educator’s guide to user-generated learning. Larchmont, NY: Eye of Education. Witek, D., & Grettano, T. (2014). Teaching metaliteracy: a new paradigm in action. Reference Services Review, 42(2), 2–2.